First Impression: Tree-lined, walkable streets, historic gaslights and fun, independent shops and eateries make the neighborhood of Gaslight Clifton an eclectic urban village. With a mix of living arrangements ranging from college student and young professional rentals to millionaire estates, Clifton residents are a motley crew, diverse in race, class, age, politics and background. The main street of Ludlow Avenue offers all the basic amenities, including a pharmacy, grocery store, library, post office and movie theater, as well as a plethora of non-chain restaurants, neighborhood bars, coffee shops and boutiques. There is something for everyone on Ludlow and although a residential area, it's also a destination for many across town (and especially for University of Cincinnati students) looking for a nice night out at a restaurant or the movies. Clifton is also on the main route for multiple bus lines, with quick access to I-71 and I-75 and close proximity to downtown. Second Look: Cincinnati was recently named the Best Walking City in Ohio - with neighborhoods like the Clifton Gaslight District, it's no surprise. A Clifton resident, especially one working downtown or in a neighboring area, could easily park their car and leave it for a week without ever needing to start it up and waste costly fuel. Instead, they could use their feet to reach everything from groceries to bars and restaurants to a picturesque hilltop sunset view. Northside and Downtown are also only a quick bus ride away. Situated close to the University of Cincinnati, but far enough to bypass the college nightlife scene, the Clifton Gaslight District offers a few relaxed community bars, where everyone is (eventually) likely to know your name. The main strip, Ludlow Avenue, also offers varied culinary offerings such as Indian, Italian, Chinese, Thai, Mexican Fusion, American Fusion, Greasy Spoons, Mediterranean and of course the ubiquitous Cincinnati favorite, Skyline Chili. Although the quiet, village feel of Clifton Gaslight doesn't offer a raucous bar scene like its neighbors (Northside and University Heights), it does offer access to all the entertainment essentials, including one of Cincinnati's few independent art house movie theaters, the Esquire. In addition to the University of Cincinnati, Clifton Gaslight is also close to other educational institutions, such as the Hebrew Union College and Cincinnati State Technical and Community College, which boasts one of the best culinary institutes in the country. The Gaslight area is also home to some great public green spaces in which to relax and enjoy nature. At the corner of Ludlow and Clifton Avenue, Burnet Woods offers an urban retreat for a picnic or some Frisbee; the Rawson Woods nature preserve is within quick walking distance and Mt. Storm park offers a great view of the Northwest side of the city. 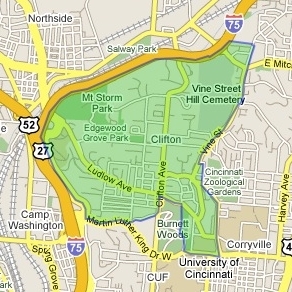 Clifton is also a three-minute drive from the Cincinnati Zoo and Botanical Gardens (located in nearby Avondale). Clifton has an active community life, run mostly by the Clifton Town Meeting, founded in 1961, whose members promote business, the arts and public works in the Gaslight area. Clifton's diverse residential base, which includes students, professors, working professionals, artists and families, keeps the neighborhood an interesting place to live and visit. On any given day, you are just as likely to see an old eccentric feeding the birds, a mother and father pushing a stroller or a graduate student anxiously banging out their thesis in the local coffee shop. All of these different interests come together to make Clifton an area that can appeal to anyone. The key word for this neighborhood is accessible - it is an easy place to be, and also has plenty to offer those on a budget.